After I do a few more trials, I'll post greater details on the recipe site, but since it is getting close to Easter and eggs will soon be on sale, I though I would post the basics, incase some would like to do this. After seeing a food show on how to make hard "boiled" eggs in your oven I decided to test it out in the Bradley. I have a dual element modified Bradley, that is controlled by a temperature device. I had planned to cooked the large eggs for 1 hour at 225°F, applying hickory smoke all the time. I rotated the rack, half way through the cook time. After 45 minutes I tested one egg and it was done - it was slightly over done. A greenish tint began forming around the yoke. I will lower the cook time to 40 minutes next time, but 45 minutes may be just right for extra large eggs. I removed them from the smoker and placed them in ice water a few minutes to stop the cooking. My first trial turned out pretty good. Some smoke did penetrate the eggs, and there was a slight hint of smoke. After testing two I left the rest in their shell, placed them in a sealable bag, and will refrigerate for 24 hours to see if more of the smoke on the outer shell will penetrate to the egg. I know a lot of members believe in unicorns, so below is a picture of large white smoked in the shell eggs. If you look at the color of the peeled egg that is cut side down, it is darker than the inside of the egg (egg that is cut side up). Use eggs that are very near or past the sell by date. They will peel easier. I may start with a lower temperature, so that I can apply the smoke longer, but timing of when the eggs will be done will be tricky. If you do this, remember I have a dual element modified Bradley, with a temperature control device. So I was able to get my temperature up quickly, and maintain that temperature. If you have a stock Bradley, your cooking times may be longer, so when you feel they are done, test an egg to see if they are fully cooked. Is this better then smoking peeled hard boiled egg? I would say no. But there is something about the texture and flavor I like. So if you have some extra space in your smoker and you want to give it a try, it is worth doing. I agree with Beefman, this is very interesting. I bet they will pickup more smoke flavor from the shells while resting in the fridge. Sometimes leftovers of smoked products really come to life after a rest in the fridge. I'm going to peel a couple this evening to see if the smoke flavor has improved. I tried a couple of more eggs this afternoon. So that made about 48 hours they were in the refrigerator, with shells on. I could not detect any noticeable increase in smoke taste, also being cold and straight from the refrigerator, there is a tendency not to taste flavors as well in cold foods as one does for hot foods. I thought they would be more difficult to peel, but they peeled fairly easily, just a little more difficult to peel then the other two I peeled on the first day. Judging by the thickness of the greenish color around the yoke; some were more overdone than others. 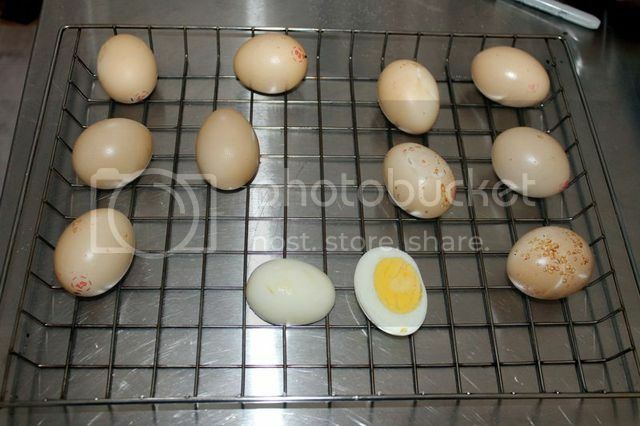 If you are doing a cook, and you have space for a rack or two, this method will cook your eggs in the shell.